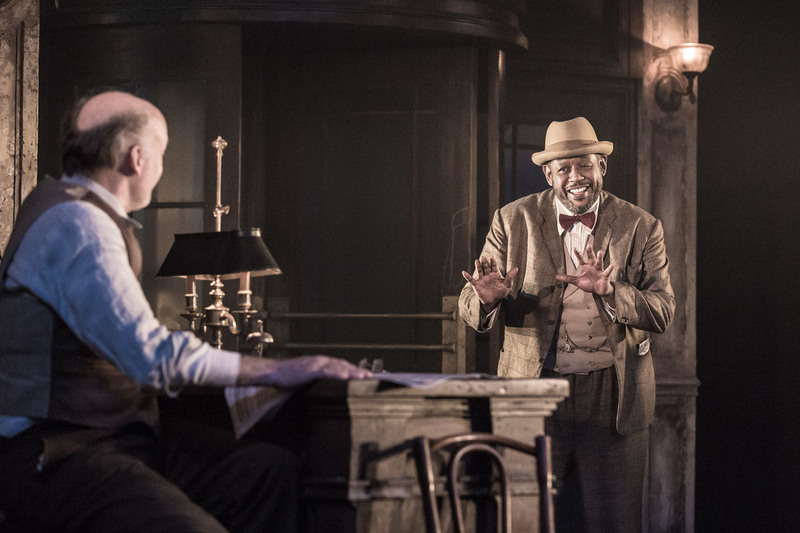 Frank Wood and Forest Whitaker in Eugene O'Neill's Hughie. The Academy Award-winning actor Forest Whitaker has offered a series of diverse and astounding star performances in films such as "The Crying Game," "The Last King of Scotland" and Lee Daniels' "The Butler." Thus, he is not just another movie star stopping over on Broadway for a limited engagement; he is an actor we want to see and who's work we want to see. Unfortunately, he is now at the Booth playing Eugene O'Neill's stemwinding character Erie Smith, a character he hasn't been able to crack. Erie Smith is the catalyst of Hughie, an extended character sketch from 1941 or so that is not quite a play; at least, O'Neill apparently considered it unstageable and left it among his unproduced manuscripts when he died in 1953. Worn out--and understandably so--after writing the lengthy Iceman Cometh and Long Day's Journey into Night, O'Neill conceived a series of eight one-acts (to be called "By Way of Obit"). Hughie was the first, and the only one that seems to have been completed. O'Neill's widow allowed the script to be presented by the Royal Dramatic Theatre in Stockholm in 1958. It next surfaced in 1963 at the Theatre Royal in Bath, England, starring Burgess Meredith. Jason Robards--who had established an affinity for O'Neill with the original Broadway production of Long Day's Journey, in 1956--played it here in 1964. Subsequent visits have come from Ben Gazzara in 1975 and Al Pacino in 1996, with Brian Dennehy playing it in Chicago in 2004 and elsewhere. But Hughie--as the playwright suspected--is not quite workable as a stage piece. 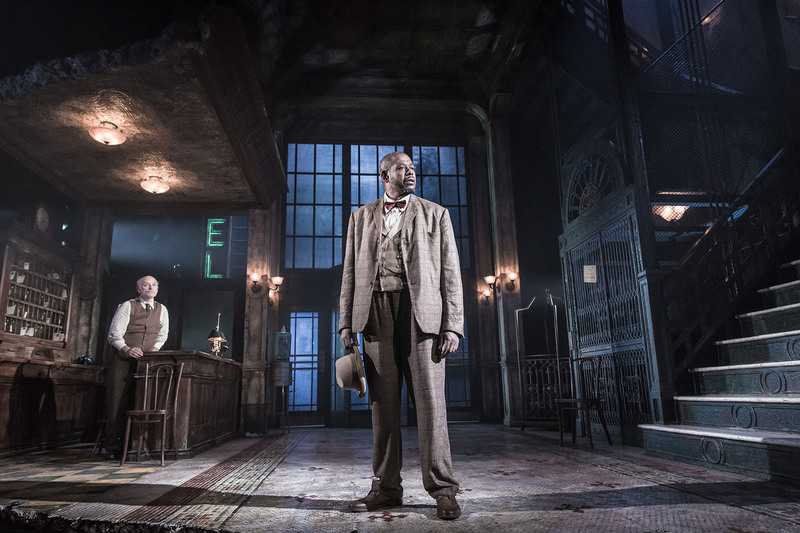 A character study, and a rich one; but not a satisfying play. (At the Booth, it runs around 55 minutes, including several stretches of "atmospheric music" by Adam Cork.) Erie appears to be yet another of those longwinded O'Neill characters chasing bar-room pipe dreams, as in The Iceman Cometh; in fact, one suspects that some producers--contemplating the 19-person cast of Iceman--have settled on Hughie as being easier to, and cheaper to, produce. The same sense of the wrong play at the wrong time applies to director (and coproducer) Michael Grandage, who has given us memorably special evenings such as Frost/Nixon and Red. The only participant who perfectly captures the futility of the piece is Christopher Oram with his majestically rundown hotel lobby dominated by an endless staircase into the flies. Whitaker and Grandage can certainly combine for high octane theatre, you would expect; but not this time, starting as they did with a not-quite play. Far more interesting than Hughie is Barry Malawer's Dead Dog Park, at 59E59. "What happened?" a distraught policeman asks in the opening line. (Being a realistically up-to-the-minute New York City story, there is naturally an expletive in that sentence.) A teenager has been pushed from a fourth-story window by said policeman. Or, the policeman was reaching to prevent the boy from falling. The innocent 13-year-old was yet another case of big city police brutality. But the 13-year-old was a drug addict with a police record skipping school, throwing rocks at the cops. The boy's aggrieved mother is looking for justice. Or is it money? Besides, she has a checkered past, suggesting child neglect, and why wasn't the boy in school anyway? The slick, Johnny Cochranesque lawyer is out for justice in an overall sense; doesn't matter whether the cop in this case is guilty, the police get away with this sort of thing too frequently and the City must be made to pay. It's not about "what happened." It's about justice with a capital "J," which in this lingo means money. As you can gather, this is not just another one of those TV-type crime stories, with our weekly heroes coming in and finding the truth. The truth here is unknown and unknowable (as Malawer makes clear in his final scene, played twice). Dead Dog Park is not about dead dogs, as it happens; it is (or was) a derelict park behind what used to be called Columbia-Presbyterian Hospital in Upper Manhattan, where the incident took place. 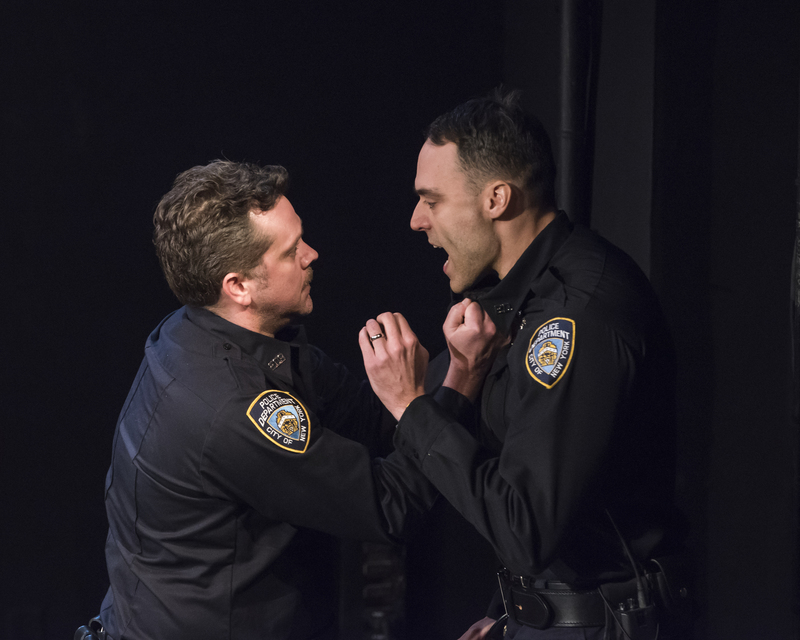 While the play sounds as if it could be torn from tomorrow's tabloids, it is neither an indictment of police brutality nor the opposite; nor is it a thriller. It is a taut, provocative drama of ideas. (The audience was so silently rapt at the final preview that when some philistine crackled a candy wrapper, it sounded like thunder.) It is also the type of play where you don't want to some reviewer to give you a detailed description. Eric Tucker--who has gained increasing visibility over the last four years, thanks to his group Bedlam (currently represented by a sterling Sense & Sensibility at the Judson Memorial Church on Washington Square)--once again contributes concise and spare direction. The fast-paced, multi-locale play is performed in 59E59's small Stage B with one table and five chairs--a setting which not only works perfectly well but ratchets up the tension. There is also some stunning overlapping dialogue in the trial scenes, where the actors briefly perform multiple characters. This method is familiar to friends of Bedlam, although Tucker's excellent work in Dead Dog Park--understandably--does not have the same comically theatrical overlay that he often provides. The excellent cast includes two Bedlamites, Tom O'Keefe (as the officer in question) and Susannah Millonzi (as his wife), both of whom were memorable in last season's Twelfth Night and What You Will. Also on hand are Ryan Quinn (as the lawyer), Eboni Flowers (as the mother), Migs Govea and Jude Tibeau. While keeping our attention for a rapid and never-lagging seventy minutes, Malawer and Tucker also stun us--late in the action--with a grand theatrical surprise. All told, Dead Dog Park is an intriguing, topical and thought-provoking piece of drama.